20 classrooms, 10 teacher pairs, 1 hope. How can 20 classrooms from across the United States work together to build empathy in our next generation with educators leading the way? 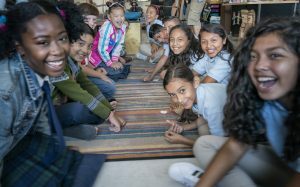 Empatico, an initiative of The KIND Foundation, created a free tool for teachers to connect their classrooms with others around the U.S.through live video and activities designed to foster meaningful connections among students (ages 6-11). As students learn together, they explore their similarities and differences with curiosity and kindness and develop practical communication and leadership skills. Empatico empowers teachers and students to explore the world through experiences that spark curiosity, kindness, and empathy.